After a lonnnng winter's nap, we bring you back to our day at the Walt Disney Studios! 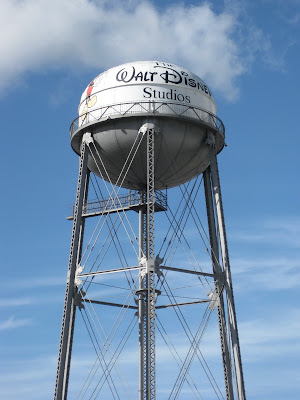 First off, let me show you the Studio Water Tower! The weather was so beautiful when we arrived, but cloudy and sprinkling when we left. I'm so glad we snapped this photo right when we got there! This is the icon for The Walt Disney Studios, which is visible from all over the studio lot. Construction on the tower began in 1938 and was completed in 1939. It no longer functions, but when it did, it originally held 150,000 gallons of water. Fun fact: The picture of Mickey and the words were not painted on until 1986! Also, the tower itself is 135.5 feet tall. That's only 11.5 feet shorter than the Matterhorn in Disneyland! After the movie, we were brought to a sound stage where we got to visit every single one of the Disney Princesses! I was much more excited than the boys! 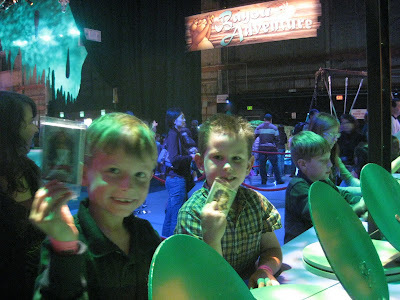 But the boys were excited about the Bayou obstacle course and the carnival-style games where they could win Princess and the Frog trading cards. 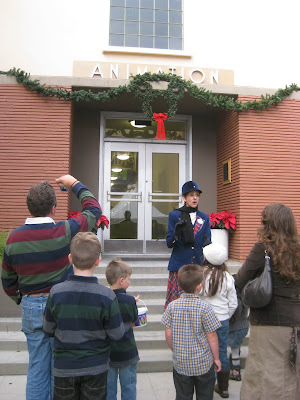 Following hours of fun in the sound stage which included drawing lessons from one of the animators on the film, we enjoyed a private tour of the Studio grounds with Dianne, a tour guide from Disneyland specially brought in to show us around. We started in the famous Animation building that Walt Disney built with the profits from Snow White. Walt was very concerned for his animators, and the building was designed in a series of four "wings" which allowed every person to have a large window for natural light. It was amazing to walk the halls which were lined with original animation cels and concept art, including a painting for Alice in Wonderland (my all time favorite). After walking through the Animation building, we came outside and found ourselves right in front of the Team Disney Building. It houses the offices of the Disney Board and CEO. 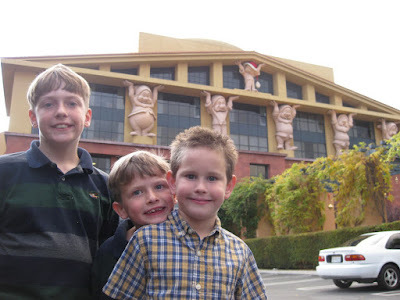 The building was finished in 1990 and features the Seven Dwarfs holding up the building, a nod to the fact that the revenue from Disney's first full length animated film, Snow White and the Seven Dwarfs, allowed Walt to purchase the 50 acres the Studios sit on back in 1939. 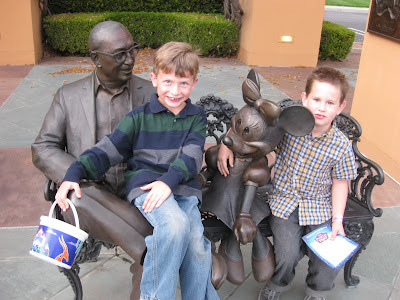 Here are Benjamin and Seth sitting on the statue of Roy Disney and Minnie Mouse. 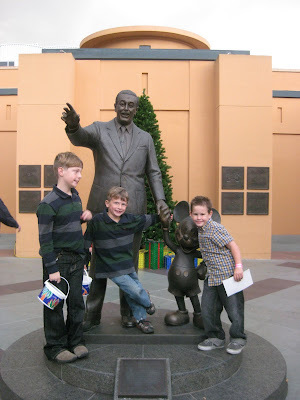 This statue has a twin in Walt Disney World's Magic Kingdom, which Roy fought to open after Walt Disney's death. For those of you who frequent Disneyland in California, this statue should look familiar! It's the famous Partners statue which has a twin just in front of Sleeping Beauty's Castle. They are the same size, but the one at Disneyland sits high up on a pedestal surrounded by plants, so it looks much larger! I was hesitant to do it, but we were told it was okay for the boys to stand up there to take a photo. 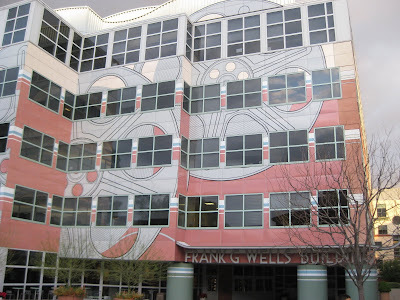 The gorgeous exterior of the Frank G. Wells building, which houses the Disney Archives. It was completed in 1997 and dedicated to Wells who was President and COO of The Walt Disney Company for ten years before he died in a helicopter crash in 1994. Inside the building we got to wander around costume pieces from many beloved Disney films and a hat gallery displaying hats from a wide range of movies and TV shows. 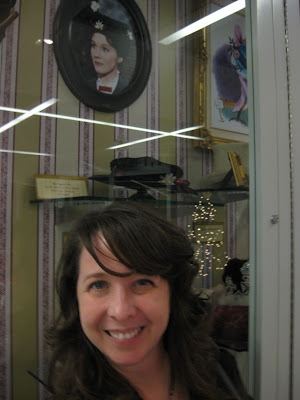 Here is Michael's sister, Holly, in front of the flat, black costume hat for everyone's favorite nanny, Mary Poppins. There was also a cowboy hat worn by Darlene from the original Mouseketeers and even the leather tricorn hat made famous by Johnny Depp as Captain Jack Sparrow. 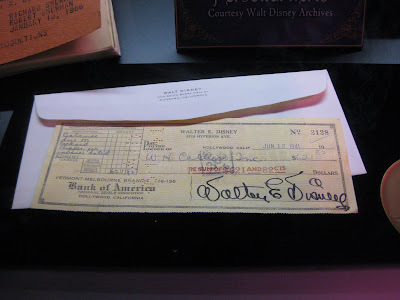 A cancelled check, bearing Walter E. Disney's signature marked "Balance due on Packard Clipper, per invoice dated 5/14/41" in the amount of $621.82. Look at that amazing autograph! 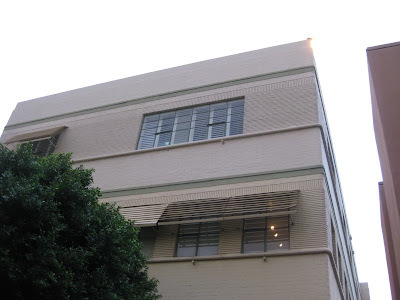 The last stop on the tour was the corner of the building that housed Walt's office at the time he passed away. The contents of the office were preserved and placed on display at Disneyland for many years before being shipped off to Walt Disney World, about fifteen years ago. I remember seeing the display many, many years ago and being struck by the miniature reproduction statue of Copenhagen's Little Mermaid from the original Hans Christian Andersen story which was sitting on his desk like a paperweight. I knew that Walt had visited Tivoli Gardens in Denmark in the 1940's, his inspiration for Disneyland, and must have seen the beautiful statue of a forlorn mermaid, sitting on a rock. I remember wondering if Walt had looked at the Little Mermaid statue and imagined creating an animated film of the story, and if it would have been anything like the Little Mermaid movie that the Disney company actually created in 1989. I doubt it, as the original story was so tragic and the "Disney" version is, well, not (it's by far my least favorite). Walt's office is on the top floor in the corner. Today it's a working office for David Cassidy of Partridge Family fame. Go figure! I can't fully describe what an incredible day this was. As a lifelong fan of Disney, it was a huge treat. Holly is an artist who gave serious thought to becoming an animator at one point, so this was a major high point for her as well. As we drove home, I mentioned to Michael and Holly that one day the boys will realize what an honor this was. But Michael disagreed, and said that our boys are going to be so used to these perks that they may miss the value. I really, really hope not!